I'm declaring mint and sea foam green my color for summer. I typically gravitate towards certain shades every season. I'm already eyeing lots of mint colors and pre-planning mint manis. One mint polish I've always wanted in my nail polish collection was a mint holo. Thanks to ILNP, I have a mint holo this year! 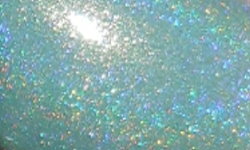 Princeton is a pastel mint green holo. Color: This is mint perfection. I love the shade of mint this is, and the biggest bonus is how balanced it is with the holographic effect. I've seen some color holos where the silvery holo effect really grays out and dulls the base color. This does not happen with Princeton at all, the base and holo live in perfect harmony! Formula: Excellent easy to apply and use formula. I used 3 coats above. Overall: Princeton is an excellent polish! I love the color and the formula. I'm very impressed! This certainly will be in my minty summer rotation! In fact, I think this one may earn a spot in my Top 25 of 2014. I've put it on my list of contenders, which to me makes it a must have. Do you have color you think you'll be gravitating towards this summer? I love a good holo and this shade looks unique. Super pretty! That is so pretty! I love the color of it too. So gorgeous for the summer! love! Beauty! You are on trend. I keep seeing seafoam green being touted as the color of the season. this is a fun take on it. butterLondon Fishwife(yes, your swatches made me pull the trigger on that one) is the only green holo in my stash, but it feels just right for Spring. This one is brighter, but just as soft and pretty. Very nice. I can't wait to get my hand on this. I ordered it yesterday and the ILNP polishes are just awesome. Holy cow! That color is gorgeous! This certainly is a stunner! I love minties too :).